Style: Cartoon, Cute Features: Cartoon Bear, Stripe and Dot, Waterproof Perfect for men or women to cook in the kitchen, also great for BBQ or picnic. 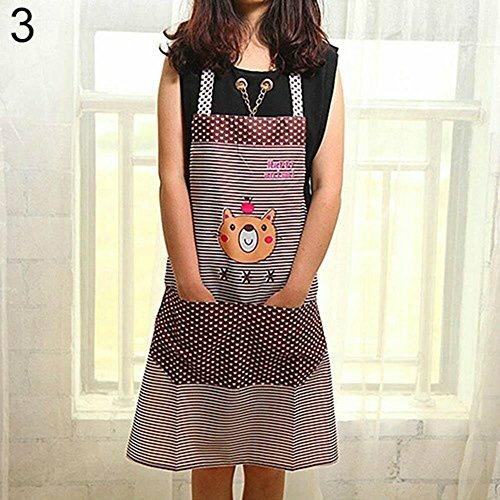 Lovely cartoon bear stripe dot apron with pocket in the front. Size: 68cm x 66cm/26.77" x 25.98" (Approx.) Durable and useful, keep you clean in style. 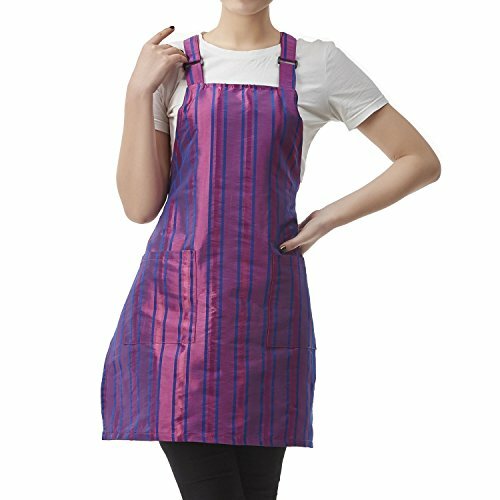 Package Includes:1 x Apron Material: Polyester Type: Apron Notes: Due to the light and screen setting difference, the item's color may be slightly different from the pictures. Please allow slight dimension difference due to different manual measurement. The apron is designed in such a fashion that it provides a comfortable perfect fit for all body sizes. It's made of 65% Polyester 35%Cotton and washable for easy care. Size: 33.5"L x 24.5"W It is quite long with two pockets in the apron which are on both sides. It provides ample space to keep tools and recipes handy. It also has adjustable ties at the neck and long ties at the waist. They are perfect for cooking, baking, barbecuing and cleaning etc. They are also ideal for a gift for holidays, Mother's Day, Christmas, parities and more. Based on attractive price and quality, buy it now! 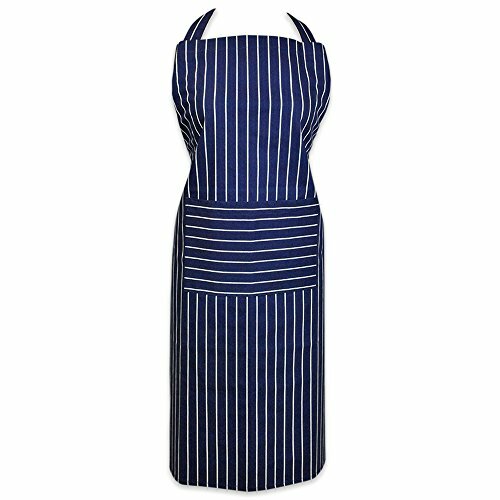 Look like a boss in the Heselian Pinstripe Adjustable Bib Apron with Pockets. 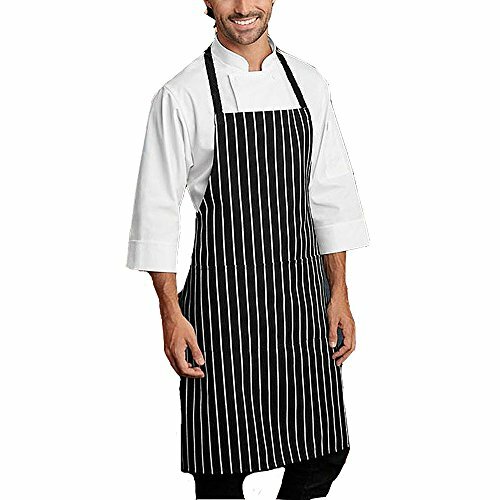 The classic black-and-white pinstripe design of the Heselian Adjustable Bib Apron immediately identifies you as the master chef of your home or deck. 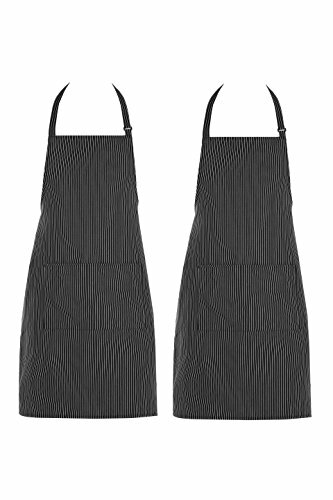 Heselian Adjustable Bib Apron is machine-washable, fade-proof, and resists wrinkles and shrinkage. Made from a long-wearing poly-cotton blend, this commercial-grade yarn dyed fabric has been treated with a soil release finish to keep it looking crisp and professional. Functional and Adjustable The Heselian Adjustable Bib Apron is a generous 33” in length and 27” wide, providing superior coverage that keeps your clothes safe from spills and splatters. The front pocket of the apron gives you a place to hold onto seasoning packets, meat thermometer, grill slips and recipe cards. With the adjustable neck strap and extra-long ties that can wrap around and tied in the front, the Heselian Adjustable Bib Apron fits most sizes and is suitable for either men or women. When you present picture-perfect, delectable meals without so much as a grease spot on your clothing, your family and friends will applaud your culinary expertise. Classy Fit - Unisex ,Adjustable straps on the neck and waist. Condition:Brand New Material:Polyester Fabric Dimensions: 25"W*31"L ,One size fits most.Functional deep pockets for clips, tips, and tools. Color: Like the pictures showed. Package:1x Hair Apron Available for: Hairdresser, Chef, Household,Nail Artist,Beautician，Pet Groomer,Painter.